Can’t find a hotel for TechCrunch50 or the next conference you are going to? If you don’t mind roughing it, try AirBed and Breakfast. Anyone with an airbed (or couch) can “post a room” and how much it costs. Thrifty travelers can make reservations on the site and pay for the stay. The site is spare but it does the job (it was pulled together for less than $20,000 in seed capital from friends and family of the founders—San Francisco designers Joe Gebbia and Brian Chesky, and software engineer Nathan Blecharczyk). 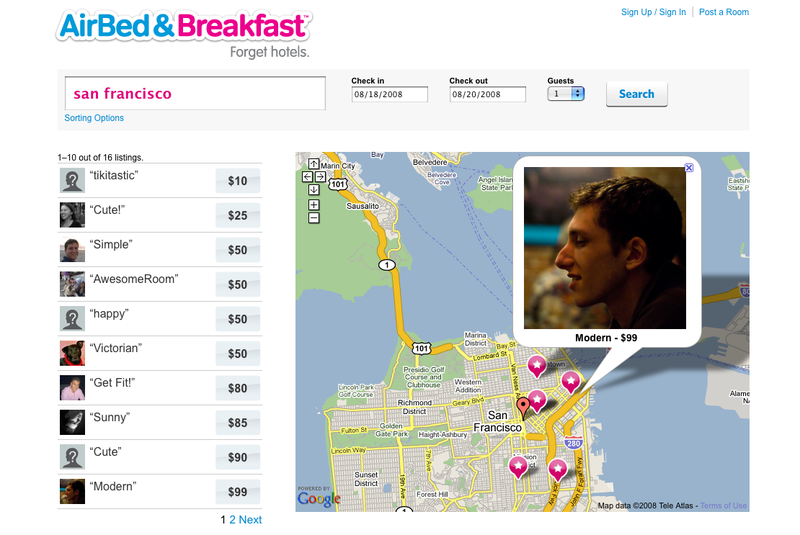 In general, the prices are usually much cheaper (rates in San Francisco, for instance, range from $10 to $175 a night, with the median being $85). And you get to stay with a friendly local who can steer you to restaurants and stores you probably would never find otherwise. My unit is a 700-square-foot loft in the historic Clocktower building, a 100-year-old warehouse renovated by architect David Baker. It has a shared courtyard space and rooftop view of downtown. Located in the heart of South Beach only a few blocks from the Moscone Center. Airbed is an AeroBed® raised mattress. The combination of the AeroBed and the Internet has now made everybody into an innkeeper.